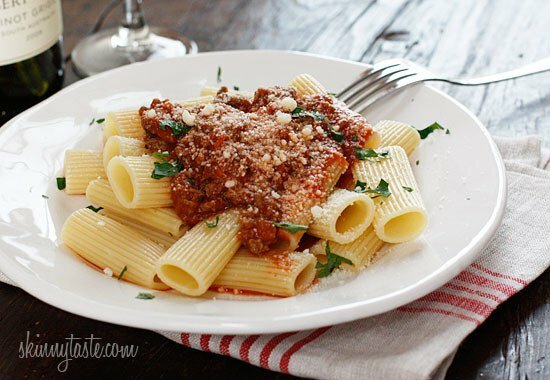 Slow Cooker Bolognese Sauce is a staple in my home! A slow cooked ragú made with lean ground beef, pancetta, onions, carrots, celery, tomatoes, wine, and cream is one of my favorite Italian sauces. I make this sauce whenever I need to feed a large crowd, or just to keep in my freezer. Serve this over pasta with a big Italian salad and everyone is happy! Because Bolognese sauce needs to cook slow and low for several hours, the crock pot is ideal for this. You can make this with ground turkey, buffalo, veal, or whatever meat you prefer. I always make it with beef, using the leanest ground beef I can find. I’ve been taking some of my existing stove top recipes and recreating them for the slow cooker which usually require some minor tweaks to make them work. 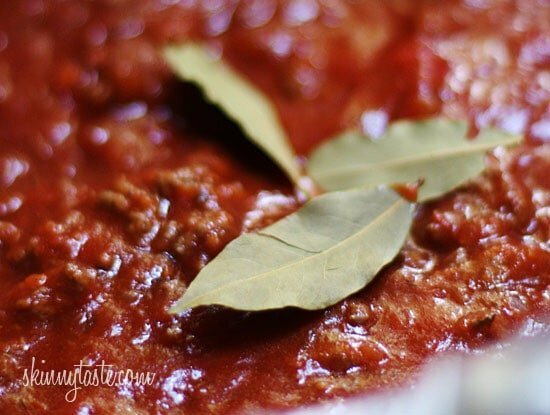 Because liquids don’t evaporate as much in the crock pot, this recipe is slightly different than my stove top Bolognese Recipe. I also have an Instant Pot Bolognese Recipe. This sauce starts out on the stove, which is essential to brown the meat then slowly simmers in the crock pot for the rest of the day. You can start this the night before if you want this for a weeknight meal, then turn it on in the morning and go to work. When you get home, all you will need to do is boil some pasta, zucchini noodles or roast some spaghetti squash, perhaps make a salad and you have a delicious meal! 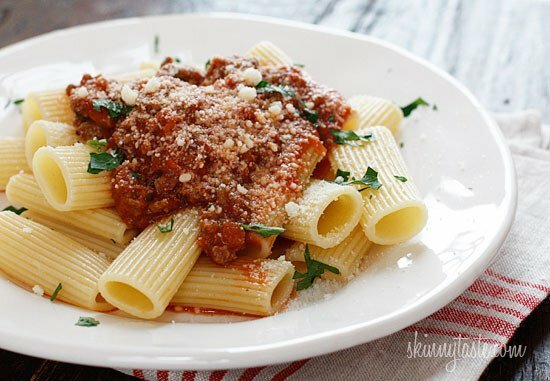 Slow Cooker Bolognese Sauce is a staple in my home! A slow cooked ragú made with lean ground beef, pancetta, onions, carrots, celery, tomatoes, wine, and cream is one of my favorite Italian sauces. After the 6 hours, adjust salt and pepper to taste, add half & half and parsley; stir and serve over your favorite pasta or spaghetti squash. Makes about 10 cups. Leftovers can be frozen for future meals. To reheat, thaw in the refrigerator then reheat on the stove or crock pot. I absolutely LOVE this recipe, exactly as is 🙂 Thank you, Gina! I have made this several times, and have put portions in the freezer for future dinners-ALWAYS DELISH! Just made this with ground venison. Wow! Reminds me of grown-up Beefaroni! So delicious! I was skeptical about the lack of seasonings, but this is very good! My 4-year-old liked it so much, he licked his bowl! I entered the ingredients into the WW app build a recipe and I came up with 5 FS points. I just made this and when I put it into my WW calculator it came up 4 points on a freestyle scale. Am i doing something wrong?! IT IS AMAZING THOUGH!!! but you know, one point can make a difference! We don’t eat pork. What can I use instead of the bacon?? I LOVE all of your recipes…..
I’m really tempted to add minced garlic to this?! Maybe it doesn’t work so well in the crockpot? I made this with 1 1/2 lbs trimmed and 1/2 inch cubed skirt steak in place if the ground beef and it is so good! I also added a bit more wine during the deglazing process, and 2 tbsp of tomato paste, thyme, and an old Parmesan rind to the crockpot. It was much easier than the traditional bolognese I made before, and just as delicious! Thank you for the inspiration! I made this earlier in the week and have been enjoying it over pasta or spaghetti squash. Today I made the two ingredient dough, divided it into 4 pieces then rolled them out thin. I put about a 1/3 cup of the Bolognese sauce in the middle of each with a little cheese. Folded them up and pinched the edges. Topped with an egg wash and a little sprinkle of garlic salt and baked for about 15 minutes. They were fantastic! Thanks for all your recipes. Has Gina or anyone used this for stuffed peppers, taco salad or other recipes? I think it has a lot of possibilities. Could I cut the recipe in half? Only cooking for two. Same cook times? Made the recipe exact. Found that it was to acidic and needed sugar. It was bland as well. I don’t recommend this recipe. It tasted better after I tweaked it a bit and added fennel and fresh basil. My family LOVES this recipe. It’s fun to make and goes together so easy. I’ve never used a crock pot. I simmer it on the stove in my Dutch oven. I like to make it when people come over. I put it together a few hours before they come over. The house smells yummy and we can eat when we’re ready. Have you by chance converted this into an Instant Pot recipe yet? Thanks! Gina, can you somehow do this in the instapot?? Could this be converted to an Instant Pot recipe? How long in the instant pot? I’ve retired my crockpots! Could I leave out the pancetta without losing the depth and flavor? Also, instead of using the 95% lean ground beef, could I use a regular beef? I don’t have the lean beef in my freezer at the moment. Thank you! If I half the recipe does it change the cooking time? What kind of white wine do you use for this recipe? I’ve never cooked with wine before so I’m a little intimidated by the thought. What white wines do you recommend for cooking with and how do you know which ones to use in which dish? Sorry for all the questions. My husband and I are big fans of all your recipes we’ve had so far! You can use sauvignon blanc, or pinot grigio, or whatever you have on hand. This is the same recipe I make on the stove. I don’t know why I didn’t think to do it in the crock myself! What a time saver rather than standing over it for hours! Excellent recipe! Thank you! It should still be the same time. I love this recipe. I have some digestive issues and have to watch my fat content so I used fat free milk instead of cream and it was still delicious. Thank you gina for all you do. I made this in the crockpot and how Devine! I did add 2 cloves of garlic, some garlic powder…..I looooove garlic lol and some fried Italian seasoning. Instead of white wine I used about 1/2 cup beef stock. My whole family lived it! All of the kids ate it up. The best part is you can’t even tell it’s full of veggies. I love pulling a fast one over my husband when it comes to feeding him healthier options. This recipe is a keeper for the books in our household. Thanks skinnytaste I love your website and Facebook page. You really make weekly dinner planning much simplier. Hi! I’ve mad really this before and it is so good. Have you tried it in the instant pot? I’m trying to figure out how long I should put it on for. Has anyone used ground turkey? This is my new favorite recipe! It makes a huuuuge amount, so we froze most of it in small containers. It’s super easy to defrost in a hot water bath and then reheat in the microwave. So nice to know that it’s always there when I need it. can you cook this on high in the crock pot to reduce the cookin time? Simply wonderful. Made it twice already in the past two weeks. But when I calculated the points, I came up with 5 pts. Per half a cup. How did you get 3 pts.? Made in the instant pot and was delicious. Followed directions exactly sautéing in the pressure cooker. Added garlic as other commenters noted. Cooked meat through, and used red wine instead of white bc of what was already open, it gave it some nice depth so it was a good coincidence. Added a touch of basil/oregano but that’s my preference. Pressed the meat/stew button and turned it down to 30 minutes. Let it rest naturally 15 minutes once done. Was delicious and will make again. Having to make some changes, it will be back up asap! We made this Monday and it is delicious! Knew it would last us a few meals, but I think I should freeze some. Only 2 of us in the house. 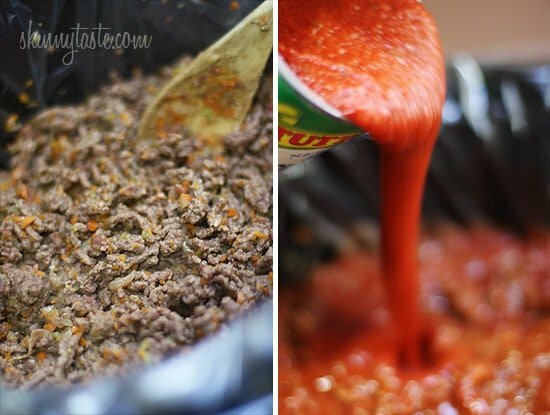 Do you have ant tips or how to’s for freezing this yummy sauce? I would freeze in smaller freezer friendly containers so you don’t thaw the whole batch when you want to eat it. Take it out the night before! Thank you! Huge fan – love your blog and both cookbooks! I made this yesterday and let it “meld” in the fridge overnight. It truly is amazing. My local store had Tuttorosso products for $1.00 a can. Only change I did was I added 2 cloves of crushed garlic. This is a 2 thumbs up recipe. Filled a quart Jar to give to my son tomorrow as an early Christmas gift along with box of pasta and salad fixings! Thanks Gina. I just made this tonight! Oh my goodness! So good! I think this will be my new ‘go-to sauce for pasta! It’s perfect on that Sunday when you have lots of planning to do to get ready for the week — just a little prep, and let it cook most of the afternoon! I made this yesterday for the first time and could not wait until it was done to sneak some bites. I served it over zoodles and it was really delicious. Made half ground sirloin and half ground turkey. Will definitely make it again! I am about to make this sauce for my upcoming work week. I work 3 12 hour night shifts at the hospital. I wont be able to freeze and reheat at work. Will the sauce be ok if it goes into the fridge (instead of freezer) and then i microwave it at lunch time? My only option but dont want it to be ruined. If you are using it this week then yes, it should be fine. Made this tonight and my family was not a fan. I put leftovers in two freezer bags. I will try adding garlic and oregano. For all the recipes I’ve made from Skinnytastefastandslow have been great. Don’t know what went wrong. Maybe our taste buds are off. Oh well… I’m not giving up. I can’t wait to try this, but I was hoping for the sat fat info to confirm the smart points value. Using the info as is, I come up with 7 smart points. I also plan on using turkey instead of beef – would that change points? Thanks for all your hard work that makes your site a favorite! Hi Gina! I just got back from Rome, and was craving bolognese. Found your recipe and made it yesterday. So easy…so good. Another winner from your site. Thank you!!!! Hi Gina. I want to congratulate you! This sauce is the ONLY sauce my picky kid will eat. We have been cooking it for years. It’s on a regular rotation no matter what the season. I have just purchased an InstaPot. Think I can make it in that? Was wondering if you have ever tried and if you have tips or tricks. Even if you haven’t tried any of the tips, I’d be happy to give it a whirl and report back! Again, thank you for all you do. We love this site and have used it for years. I can’t have dairy… Is there a substitute I can use in place of the cream because this sounds delicious!!!! Ashley, I have done four rounds of the Whole 30 and have used coconut cream in place of it. I have also just left it out. Both were delish. What is the best way to mince carrots and celery? Is there a wine alternative? What kind of wine should I use? There are so many different kinds and I’m not a wine drinker so I’m not sure. Thanks! Making this right now and it smells so good! Waiting on husband to get home to add the cream and parsley and am serving it over my new favorite thing-zoodles (zucchini spirals). Love your recipes and use them all the time-thanks! You’re welcome! Zoodles are great!! Hi Gina! Would the recipe change at all if I used ground turkey meat? Can you do the prep work the night before and throw in crockpot in the morning? I made this last night and followed the directions exactly (except for adding some fresh garlic to the sauteed veggies/meat). It tasted pretty good, but was too liquidy, the tomato juices ran all over the plate – the consistency was not “sauce-like.” If I made this again, I might try half tomato paste instead – anyone tried that? Gina – what can we use instead of wine? How about this in the InstaPot electric pressure cooker. Would it be as good. Gina could you puree the tomatoes as my kids are not a fan of chunky tomatoes or would this make the sauce too watery? Made this today and it is a great recipe. The only change I made was the addition of some minced garlic added when the veggies were done, one minute before adding the beef. Served it over half & half pasta–1 oz. linguine and a nice amount zucchini "pasta". Just finished packaging it up in singles servings to freeze. I foresee eating this at least once a week all winter. Thanks for the conversion to Smart Points. Is the cream only for topping at the end? Or does it go into the recipe itself? Made this tonight instead of the same old spaghetti sauce and it was a tremendous hit! Fabulous recipe, Thank You!!!!! I was adding this to my WW tracker and the calculations are off. I am showing that it is 4 Smart Points. Also the Sat Fat is not listed. Am I seeing things wrong? froze some for another time….Thank you…I am sure converting everything to smartpoints is time consuming…Thank you for your efforts. I appreciate it more than you know!! I forgot the wine :(((( and it's already in the crockpot…is it ruined??? This is an awesome recipe. I however did not chop my celery small enough or saute it long enough. Even after 4 hours in the crockpot, it's still very solid. (and inconsistent with the overall lovely meat-sauce consistency. Also didn't add the half and half (just forgot). Still great. 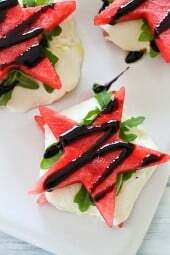 Hello, I don't think my previous comment made it, I was wondering if it is possible to half this recipe? And then would I half the cook time? I looked and looked for the right recipe. Can always count on finding it on your site. My husband doesn't like tomatoey sauce but loves meat. I made it just as you instructed. He's in the other side of the house and has said how good it smells. I can't wait until 6:30 when we get to try the finished product. It was fun making and I can't wait to eat it. I'm sure there will be a toast to the dish. Thank you for your great ideas and God Bless! I realize this is an older recipe but I made it for the first time last night to rave reviews. I altered it a bit; using half ground beef and half ground turkey but otherwise everything was the same. I served it with Parmesan cheese and a chiffonade of fresh basil over rigatoni. A perfect husband friendly meal. I only have a pound of meat. Should i half the other ingredients? Hey, Gina! I know I'm late to the party on this recipe, but I have a question. I'm thinking of making this for a crowd of 15-20 people, including some "healthy" men. Do you suggest I double and make in two crockpots? Goodness people…if you think the only way to "season" is with a teaspoon of basil and oregano, you're missing the boat. When you brown onions, carrots and celery…it imparts a richness and flavor to your sauce! The same thing goes with browning the meat. I've made this sauce and it rocks! If anything, add some fresh chopped garlic. It's a keeper Gina. You are so gracious to your critics, and a treasure to those of us searching for proven-to-be-delicious recipes! This was very bland as is. I ended up adding garlic powder, onion powder, Italian seasonings and oregano to give it a little flavor. I can't imagine making this using only Bay leaves. No oregano or basil? Also, any options for lactose intolerant people? Thanks! Made this for a family gathering and everyone loved it!!!! Thanks so much, I enjoy your site and look forward to using more of your recipes!! Making this right now! I also put a tin of your zucchini tots in the oven a few mins ago. love your site! I work long hours and then go workout, so to keep me from stopping for fast food or going out to restaurants, I love checking out your healthy/delish/simple meals! Thank you. I can't wait to eat this (with zucchini noodles) tomorrow! Made this last night for dinner tonight, was able to split the portions and freeze half for another time. It is yummy, my daughter was cleaning out the crockpot with a piece of bread, telling me I needed to share the recipe with her. Gina, this is truly one of my favorites of yours! I make it all the time and freeze it in about 2 cup portions. It is so easy to thaw and then reheat for a quick meal! this is really fantastic!! I added an extra stalk of celery and 8 oz of mushrooms. also, I kept in on low in the crock pot for about 8 hours instead of 6 because I was away from the house. finally – I added a whole cup of half and half and it didn't change the points! great! My husband and I, after some serious medical conditions, are determined to enter summer as healthier individuals. Somehow I stumbled upon your fascinating and exciting site and began compiling a recipe box. We enjoyed our first SkinnyTaste meal, Crock Pot Bolognese Sauce, earlier this week and it was fabulous. I made it exactly as written and it was excellent. Generally I avoid reviewing recipes and purchases but you. Gina, and your site are too marvelous to ignore; I am eager to continue incorporating more SkinnyTaste recipes into our improving lifestyle and health. Obsessed with this recipe! Prepared the recipe Sunday night and put it in the slow cooker Monday morning! I absolutely loved it. VERY tasty. I paired it with polenta made in the rice cooker as a pasta alternative. 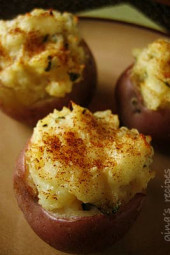 I am also planning on using some of the left overs as a slow cooked baked potato topping! Froze the rest and will use it for pasta in the next few weeks! Very happy with this recipe! Thank you! I totally made this for valentine's day dinner with the exact thought that I didn't want to be in the kitchen the whole night. Best way to a man's heart is through his stomach! Just took my first taste out of the crock pot and it is AMAZING!! I prepped everything last night and threw it all in the crock pot this morning before I went to class. I made a few changes just because I didn't have everything I needed on hand. Instead of 2 lbs. of ground beef, I used 1 lb of ground beef and 1 lb of mild Italian sausage. Then I was a can short and instead of 2 – 28 oz cans of crushed tomatoes I used 3 – 15 oz cans of crushed tomatoes, a 15 oz can of tomato sauce, and about 2 tbsp. of Italian style tomato paste to compensate for the difference in thickness. Also used red wine instead of white wine and threw in some garlic as well. Can't wait to pour it over pasta for dinner tonight, thanks for the great recipe!! Gina, when you say you can start the recipe the night before do you mean brown the meat with the veggies the night before and then put the mixture in the fridge? thanks. Yes. 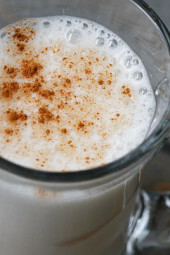 You could even put it in he crockpot and save yourself that step in the morning! I've always made a traditional bolognese sauce. Full of fat. I made this for dinner the other night expecting it to be good but not quite as good as my traditional recipe. Nothing could be further from the truth. Turns out I like bolognese better when it's low fat! Plus this is so much easier to make. Thank you so much for this recipe. It is delicious! My husband, 9 year old and two toddlers love it as well! I've been a "lurker" for about a year, and have enjoyed every recipe I've tried. This one is so good, though, that I have to comment on it. I followed the recipe exactly, and served it over ziti. My husband, friends and I absolutely loved it … and the two of us enjoyed the leftovers. Love this site, and hope you can keep it up forever! I made this yesterday and it is so delicious; thanks for yet another great recipe! I do have a question about the points and PLEASE forgive me if someone already asked, or if I am missing something in the recipes. Why is the point total for the crock pot version higher than the stove top one? I don't have time for the crock pot, so I made it in the dutch oven and put it in the oven for a few hours. My house smells divine! My son asked if we could have something for dinner besides TURKEY, since I've been making every type of meal with turkey or chicken lately. So, Beef Bolognese it is and yes, I will add the cream for just tad bit of richness to the finished product. CREAM!?YIKES! A real authentic Bolognese sauce does not include cream. 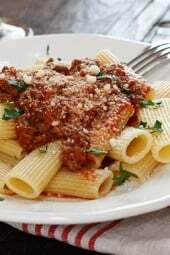 Omit the cream, butter and use lean ground veal instead of beef for a leaner more authentic sauce. Save the cream for Alredo's and rose sauces. The beauty of cooking is you can make it however you please. I love the touch of cream, my favorite Italian restaurant adds heavy cream and yes, they use veal, but I try not to cook veal too often. Thank you, Anonymous food snob. 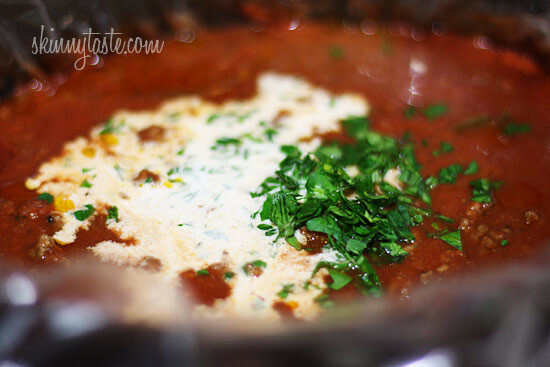 I have cooked alot of sauces and this recipe is the best red sauce I have ever tasted or made! I used "San Marzano" crushed tomatoes and center cut bacon. Cooked exactly as recipe called for but added fresh minced garlic. San Marzano is the best! SO HAPPY you enjoyed it! I made this yesterday for my family who is rather picky and it was definitely a hit! I left out the half and half and I used half ground beef and half ground turkey. Thank you for sharing. I will be making this again! It's always a hit in my home!